Posted on 21, September 2016 by EuropaWire PR Editors | This entry was posted in Industrial, Management, Technology, Transportation & Logistics, United Kingdom and tagged BAW Certification, BMT Ship & Coastal Dynamics, Bundesanstalt für Wasserbau, Kiel Canal Pilots, marine navigation and manoeuvring simulator, Paul Morter, REMBRANDT. Bookmark the permalink. TEDDINGTON, 21-Sep-2016 — /EuropaWire/ — BMT Ship & Coastal Dynamics, a subsidiary of BMT Group, has today announced that its marine navigation and manoeuvring simulator, REMBRANDT has been certified by BAW (Bundesanstalt für Wasserbau), on behalf of the Federal Waterways and Shipping Administration, Wasser und Schifffahrtsverwaltung des Bundes (WSV) in Germany. The BAW Certification process rigorously tests the hydrodynamic accuracy of the simulator against known ship behaviours, ensuring that the manoeuvring characteristics trainees experience on land faithfully represent the real world challenges they will face on water. 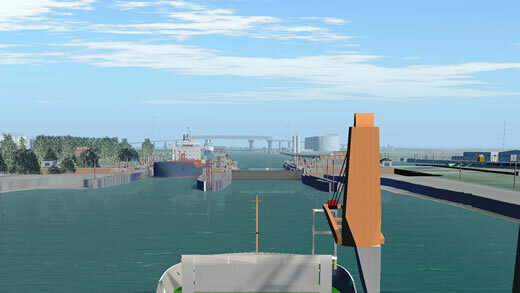 Due to a new requirement applicable to inland waterways in Germany, all simulation software and hardware which is used for training purposes for Sea Pilots and Kiel Canal Helmsmen has to be approved and certified. Paul Morter, Global Sales Manager for REMBRANDT comments: “It’s a fantastic achievement for REMBRANDT to have been awarded this accreditation, and further demonstrates our commitment to clients such as Kiel Canal Pilots who are regular users of the software.